I really am blessed with a very fine wife. This St. Georges Day was my 40th Birthday and, I’ll be honest about it, I was rather grumpy about the milestone, and my 5.50 a.m. alarm to wake me for my day job didn’t do much to improve my mood. Then Lisa hauled onto the bed a medium sized, but rather heavy tissue paper wrapped parcel. I had a good idea what is was. Those few of you who are devotees of The Wolfe will know that I am working through Thomas Babbington Macaulay’s History of England From The Accession of James II via LibriVox’ recordings on my drives to and from work. These have been an absolute joy and after a couple of months or so, the eponymous James has just fled the country, England is wringing its hands over constitutional niceties and Macaulay’s darling William of Orange is being appropriately scrupulous. I’d mentioned that I’d like a nice set of the books and made some half hearted searches on Abebooks. 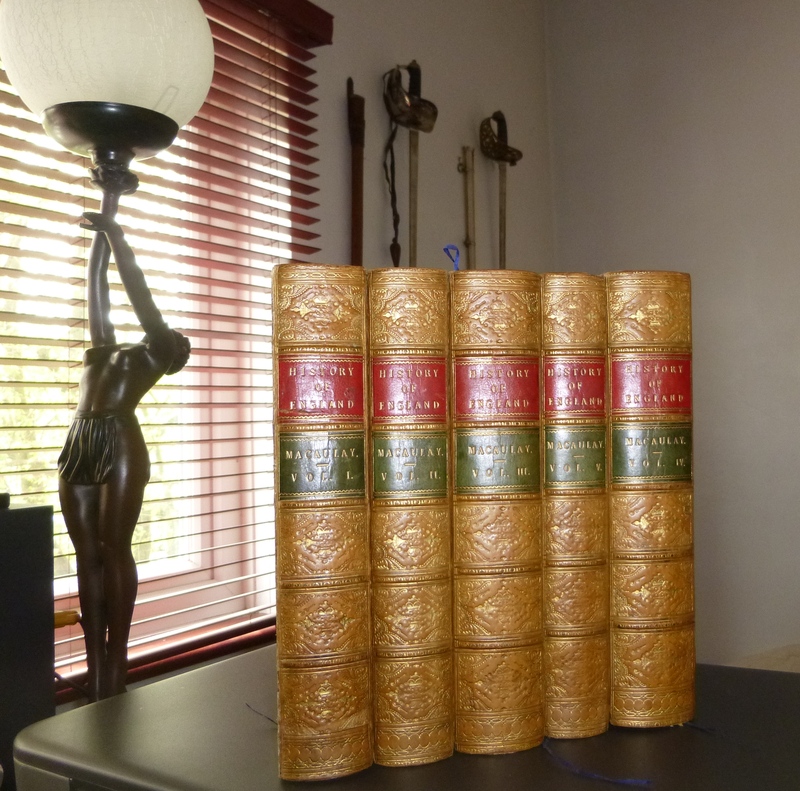 Surely enough beneath the paper was a superb complete matching five volume set of Macaulay and a far finer one than I would have bought for myself. It is nearly immaculate in full calf with gold embossing and that wonderful smell of old book. It is not quite a first edition but would appear to date from the early 1860s, probably bought as a set after the posthumous publication of the fifth volume. It is a lovely thing and my mood lifted immeasurably. There was more, however. 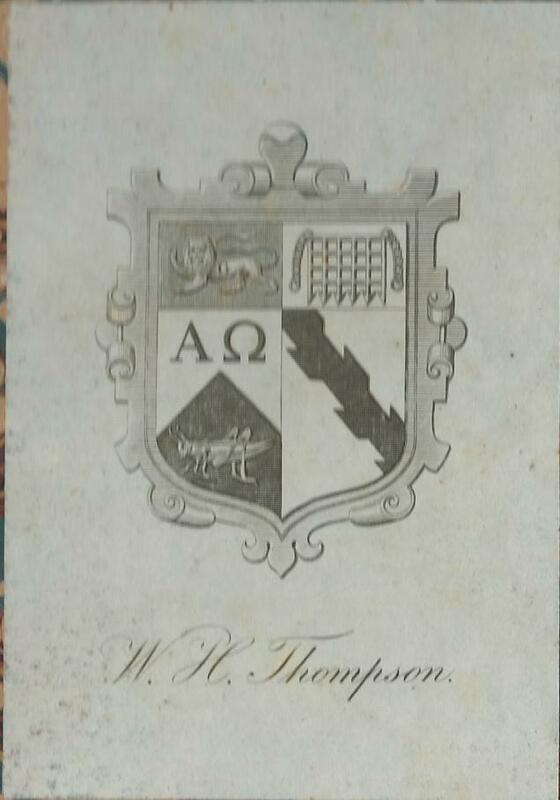 Each volume has a rather interesting book plate, showing a coat of arms and the name “W.H. Thompson”. A quick google by Lisa yielded Professor William Hepworth Thompson, Regius Professor of Greek from 1853 and Master of Trinity College Cambridge from 1866 as a possible candidate. Per chevron argent and sable, in chief the two Greek letters Alpha and Omega of the second, and in base a cicado [grasshopper] of the first, on a chief gules a lion passant guardant Or, charged on the side with the letter G sable. The crest has an owl. This isn’t quite what is on the crest of the book plate, but the lion, Alpha-Omega and grasshopper occupy the first and third quarters, so the association is clear. Heraldry is not really my forte and I’d be happy of any correction from anyone who knows better but I assume that Thompson would have been granted arms when he took his professorship and he combined the symbols of his post with the portcullis and ragulée (ragged) branch in the second and forth quarters which had some personal significance. I think we can be pretty sure then, that my Macaulay came from this Thompson’s personal library. It is always a pleasure to have provenance for an antique and I’m especially pleased that my Macaulay must have sat on the shelves owned by such a prominent academic as Thompson. He and Macaulay were contemporaries, although in rather difference spheres, but it is not beyond the realms of possibility that they may have met. 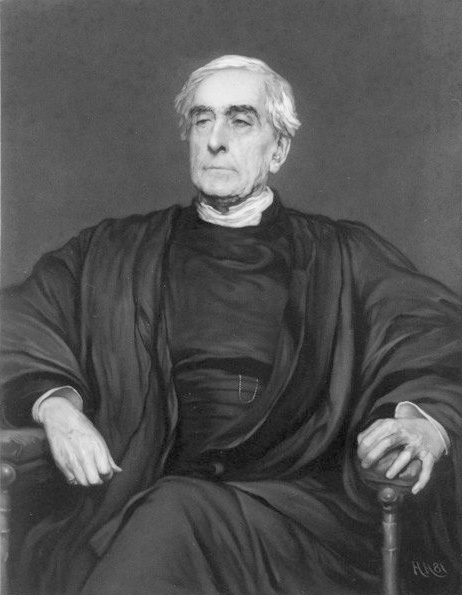 Thompson was instrumental in the removal of “tests” from Oxford and Cambridge which prevented Catholics, non-Conformists and non-Christians from taking Fellowships. The tensions caused by test acts were were a common theme of Macaulay’s History and I’d like to imagine that in some small way, Thompson’s reading of the books which would be my birthday present a century and a half later helped form his thoughts on religious tolerance which prompted this good work. As and aside, I’d like to mention that Barrie Kaye of KBooks Ltd. was very helpful and generous with his time as well as being quite charming to Lisa whilst supplying the books. The arms on the right (it’s not 2nd and 4th quarters, the blazon refers to a chief, which is the top third or so of the shield) will be Thompson’s personal arms. As Regius Professor he will have ‘impaled’ these with those of his office, as if he were married to the office. This is more usually seen with clergy, such as bishops. Thanks, Steve, I suspected someone would be able to apply far more knowledge and precision than me. He was also a Cannon of Ely Cathedral and I believe at that time Fellows of Cambridge colleges still had to take orders in the Church of England, so he was, in fact, a clergyman. It makes sense that his arms should take a clerical form.